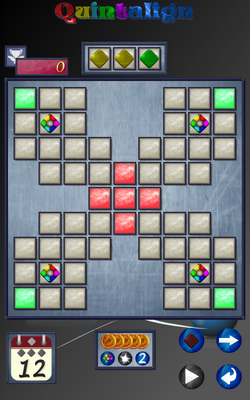 Quintalign is a combination of Align-It and Bejeweled type games on a 9×9 board. 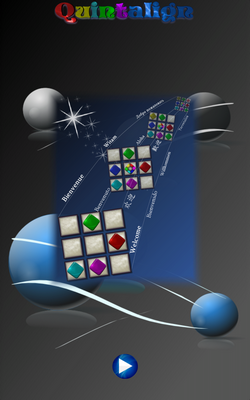 Quintalign is a combination of several “align” the pieces type games. 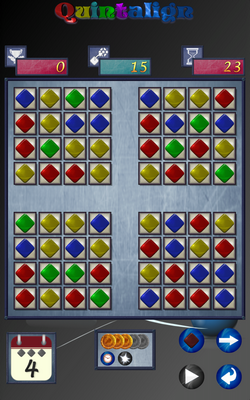 It contains two main game modes played on 9×9 (and also smaller) game boards. 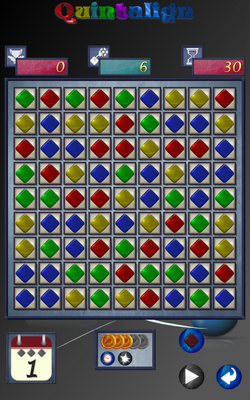 In the “align” mode [game: 1-5] you start with an empty board and have to prevent it from filling from randomly appearing pieces. This is done by aligning 5(4) or more pieces in any row, column or diagonal to remove them. 4-7 different colors as well as a joker piece are available on the board. Points are awarded for pieces removed. 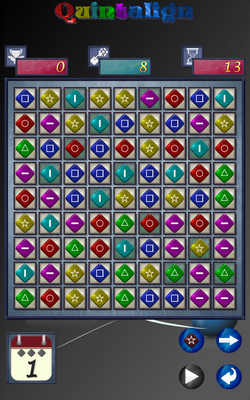 In the “swap” mode [game: A-E] you start with a full board and swap neighboring pieces to align 3 pieces in any row or column to remove them from the board (this mode is known in many games from Bejeweled to Candy Crush). To go to the next level a certain amount of moves need to be successfully made before a timer runs out. 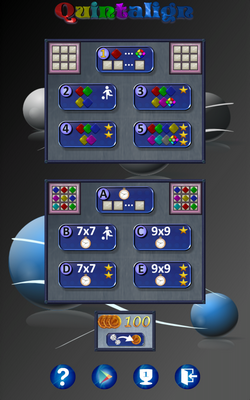 Points are awarded for pieces removed. In the campagin games you can explore many different level designs. In the highscore games you play to beat local and world wide highscores. The kids games offer easier play and less options. Note: If you have suggestions for levels or find any levels too difficult or too easy please contact us, we are happy to implement your feedback.